If you’ve been following my Insta Stories this year, you might’ve seen that one of my smaller goals for 2017 is to use reusable produce bags. It’s something I’ve tried in the past but never stuck with, so when I told Eric about the goal he wasn’t sure that I would actually do it. Especially since I’ve had a pretty bad case of new-mama brain lately. “This is going to last a week!” he chuckled. But here I am 6 weeks into 2017 and it’s going great…mainly because proving him wrong is one of my greatest joys in life. These are the bags I purchased on Amazon. I love that there are various sizes, and so far they’re holding up well! Adriana has also claimed one and likes it when I add a few light groceries into her “grocery bag” while she sits in the cart. Just remind me not to put a clementine in there again; she thinks it’s pretty funny when she bites through the skin. You may suspect we’re living off of soup these days due to how many soup recipes I’ve shared over the past few months, and you might be right! Soup has been our go-to solution during the hectic postpartum season because I can make a big batch and the leftovers only get better as the days go by. My aunt recently had us over for lunch, and she made this incredible borscht-inspired soup that I immediately knew I had to try to make at home. I couldn’t believe how few ingredients she used for a soup that blew us all away. Her secret? A jar of marinara sauce forms the soup’s base. My jaw dropped! I recreated the soup at home the very next day, and my jaw dropped again when Adriana ate 3 bowls of it in a row. She was covered in beet stains by the end, but it was worth it because I never thought she’d eat this kind of soup. Heck, I never thought I would enjoy beets in soup either, but it’s our new obsession. So if you’re worried about a beet and cabbage soup being a bit too earthy-tasting, I encourage you to give this one a try. It’s surprisingly sweet, and really satisfying. I’m also convinced the healthy ingredients helped me fight off a cold that was going through our household, too. It’s bursting with Vitamin C, iron, and B vitamins, making it a great immune-booster this time of the year! You won’t believe the gorgeous colours in this incredibly healthy, borscht-inspired soup, from the prep stage (gorgeous shades of plum and violet) to the final end result (a bold crimson red). It's the perfect soup to celebrate Valentine's Day (or really, to brighten up any chilly winter day). This soup takes an hour and a half to cook thanks to the raw beets, so be sure to give yourself enough time; the bonus is that you can cover it and walk away as it simmers. To avoid a longer cook time, chopping the beets very small (think pea- or almond-size) is key. A big thank-you to my Aunt Elizabeth for inspiring this soup. Add the coconut oil into a large pot. Over medium heat, sauté the onion for about 3 to 5 minutes, stirring once or twice. Add the diced cabbage and beets. Stir again. Continue sautéeing for another few minutes. Taste and season with salt to taste. Ladle into a bowl and serve with a spoonful or swirl of Cashew Sour Cream and chopped dill if desired, but it's great all on its own, too. This soup will keep in the fridge in an airtight container for up to 1 week. It freezes beautifully, too: Simply cool the soup and place it into a freezer-safe container, leaving an inch of space at the top for expansion. Freeze for up to 2 months. Recipe makes 9 cups (2.1 litres) total. * To prevent staining your hands, wear disposable gloves while peeling and dicing the beets. ** If you can find it, I highly recommend using White Linen Collection Marinara Sauce from Costco in this recipe. I use 1 full bottle, which works out perfectly to about 5 cups. It’s my favourite store-bought marinara sauce (I have no affiliation with them, by the way, just passing along my personal recommendation!). My Fail-Proof Marinara Sauce from Oh She Glows Every Day is also lovely in this soup! If you remember, we committed to donating the January revenue from our paid Get Glowing app bundle (for both Android and iOS) to Blessings in a Backpack Canada. I’m thrilled to let you know that we raised enough money to feed 19 children, providing them with a backpack of food to take home every Friday, for an entire school year! A BIG thank-you to everyone who downloaded the bundle of recipes. We couldn’t have done this without you! Beets are not usually my thing, but you’ve just convinced me to give this a chance. That color is stunning- and jarred marinara? That’s one of the best things about cooking- there’s always something new to learn and try. I love cabbage soups, but shy away from beets just because she can be so messy. Gloves are a good tip. And I second the recommendation for White Linen marinara sauce from Costco. SO GREAT! Angela -this looks amazing….just wish my kids could still be talked into trying new things – teenagers! Try the polite bite, Suzanne. Every meal, snack or dessert you make, they have to try one bite. This is the first rule to apply when dealing with picky eaters, small or big. If new tastes and textures never touch their taste buds, they will never learn to love eating new, unfamiliar foods. Thanks- I appreciate your input …I actually did that for a long time…but it never really got easier and I did not feel a fight was worth it…. 2 of my guys are much better as they get older…one digs his heels in more and I do not want to create more food issues for him ….it is such a balance. Suzanne, I definitely can relate. It’s so hard to convince picky eaters to try new foods. My kids are the best eaters ever (and part of what I do is to help picky eaters become great eaters), but I am a recovering extreme picky eater. I am still encouraging myself to try different foods (I am looking at you, cucumbers!) and it’s so hard to smell/taste/chew the ones I don’t like. Good luck and don’t stop trying :)! Hi Stefanie, so lovely to hear from you. :) I’ll definitely have to check that link out sometime. I hope you love the soup when you give it a try! I am wondering if you could use pre-cooked beats. TJ’s has them already cooked and vacuumed sealed. I think you could just chop them up and go. I am going to have to try this as I LOVE beets! It won’t be quite the same, but it will work well enough. I have a Russian/Ukrainian background, and on a few occasions, I’ve subbed precooked beets in traditional recipes. You’ll have to play a bit with the cooking time on the soup. I made this using precooked beets and simply heated the ingredients after sauteeing onions and cabbage. It was outstanding! Hi Hillary, I haven’t tried it yet, unfortunately! If you try anything please let us know. The biggest question mark would be how long it takes to cook and at what temperature setting. I haven’t slow cooked beets before so I’m not sure how long they take. I would try Googling a slow cooker recipe with beets to see what they suggest. Just wondering how you think it would be with green cabbage instead of the purple? Hi Heather, I think this would turn out just fine with green cabbage! Saw this recipe this morning, went and bought some beets and just tried a bowl. SOOO GOOD I love this soup. That’s great, Christina! I’m so pleased you enjoyed it. If you’re moving away from using disposable produce bags, please consider not using disposable gloves as well! Just tried this in the slow cooker and it was UNBELIEVABLE!! I added all the ingredients minus the coconut oil, set the cooker to low and cooked for 6 hours. Thank you for this awesome recipe!!! Thanks so much for sharing, Viviane! That’s great to know, and I’m so happy it turned out so well using that method. This will be next on my list. All your soup recipes are divine. Have you considered releasing a cookbook of soup recipes and entrees only? Thank you. Just tried my first bowl. So very good! I danced around my kitchen it was that good! Of course I like beets so I may be a bit biased. I am glad to hear about the slow cooker without the coconut oil method. I made it too thick, but I am thinning it out. Hey Angela! This recipe looked very intriguing and colorful, so I gave it a try right away! It was a delicious soup.. I loved the flavors as well as the simple ingredient list. To be honest, I am going to make this my new marinara sauce by pureeing everything together once the soup is cooled, and then stick it in the freezer. What a great way to sneak extra veggies into a pasta sauce and to give the dish such a vibrant color! Also wanted to say how much I have enjoyed your blog over the years. I don’t write on here very often, but please know your hard work and beautiful food is appreciated and loved by us all! Best to you and your family in 2017. Love this flavor & color, excellent making :) great to watch your blogs! WOW!! This is so beautifully red. Love the produce bag idea. We always end up throwing the ones out that we get at the store and it’s such a waste. Thanks for sharing!! I made this soup today and it was absolutely delicious! The only change I made was to use a yellow onion because I didn’t have red on hand. I also used the OSG app to follow along with the recipe as I cooked. Thank you!! Looks delicious! I’m making this today except adding some turkey sausage in the beginning. Thank for sharing! This sounds and looks so delicious. I’ve been eating a ton of beets lately in juices and salads but I crave cooked beets and this looks like the perfect recipe. I can’t wait to try it. Fantastic news about the funds you raised for Blessings in a Backpack Canada ❤️ It must feel wonderful to be able to use your recipes to raise funds for worthy causes like this ? The soup looks amazing too! Such a pretty colour! I made this for dinner tonight and it was amazing! Made a few modifications by adding some crushed red pepper, garlic powder, black pepper and dry dill. I used creme fraishe since I’m not vegan and it made it super decadent. Thanks for sharing this recipe! Love your blog. Thanks for sharing those tweaks, Zuly! I’m sure they added a delicious twist to the recipe. So glad you enjoyed the end result!! I know you don’t calorie count but I have a chronic health condition that restricts my exercise, I therefore need to watch my weight. I have been putting on weight and I need to reign it in. it would really help if the nutritional info was included. I’ve seen that it’s included for your second book but can’t find it for the first book. Is it available? Love this soup recipe! Simple, delicious, and beautiful. Thank you! Long-time follower, but almost never commenter! This soup is incredible and super easy really. I made it while my family was away, just in case as they are not beet lovers and I almost ate the whole thing, so good! I forced my husband to try it, and despite the cringing look on his face as he tasted it (he HATES beets), he then said, “Oh, wow, that’s pretty good!” I can’t wait to make a double batch this week and freeze half of it. Thank you for this awesome recipe (and all your others, which are staples in our house!!) My sister and I constantly send your recipes back and forth to each other, saying have you tried this one?? Thanks again! This is really an Delicious Soup!! Finally got a chance to make this last night and it was soooooo good! It looked gorgeous when I swirled yogurt into it. I am happy that I found this blog. I am Polish, and I make borscht ALL the time. This soup is AMAZING!!! It tastes so much like borscht it’s unreal. A lot quicker to make, and obviously meat free (unlike the big old ham bone we use). I’ve given tupperware containers full to all my family. Will absolutely be making this again! I must say, my hands got purplish red from not only the beets but also the red cabbage! I don’t mind. We’ve made this a couple of times now and our family loves it (including the 2.5 year old)! 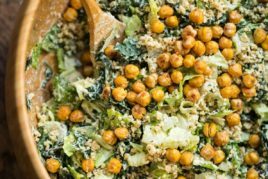 FYI, it’s REALLY good with pistachios and shaved raw brussels sprouts (adding some raw cruciferous vegetables on top of the soup will supply you with the enzymes you need to get the most benefits from the sulforaphane in the cooked cabbage!). Wow!! I love this soup! 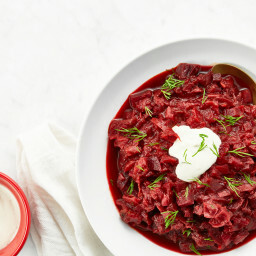 I love borscht and I think the white linen marinara really adds something. For all those comments saying it looks amazing, well let me tell you it tastes even better. Easy to make too. Love love love it!!!!! I thought this soup was okay but not wonderful the evening I made it (the marinara was too bright. We don’t have a Costco membership, and maybe with the marinara you recommended it would be better on the first night). Each successive day, it’s gotten better and better as the marinara mellowed and here I am eating the last of it 5 days later and it’s the best ever. I am so sad there was only a cup left because I love it and want more. A lot more. Angela, my solution to plastic produce bags is to use cloth bags. I bought about 2 metres of green broadcloth and sewed them in various sizes. They are open on the top so the cashier can peak inside. I just stuff them in my grocery bags and off I go. They are washable if they get icky. DIY bags are such a great idea, Annie! And you gotta love that they’re washable, too. Did you work from a pattern? Hi, do you this would work well with vegetable broth instead of water? Hey there, I don’t see why not! I suddenly thought that this dish looks a little similar with Kimchi, which is a spicy korean dish. They also use cabbage (sometimes raddish) for kimchi, by the way. Now I’m thinking, can beets be a good ingredient or alternative for a kimchi dish? I’m really craving for some spicy stuff right now. Maybe you can share me some of your mouth watering and spicy dish. I’d love to make one. Thanks in advance Angela! Look delicious, Very healthy and yummy recipe. Last night I made it and my grandpa really like it. Happened to have some leftover roasted beets in the fridge so used them instead of the raw ones. Only had organic diced canned tomatoes on hand so used them instead of the Marinara. Shortened the cooking time of course. This was a FABULOUS soup. Thank you so much for one more great addition to my repertoire. You have made me a fantastic vegan cook. I was a little skeptical about the marinara but I gave it a shot and this soup blew me away! So delicious! I’m not a great fans of Cabbage. But after seeing the images of this soup, i thought why not!!!! Really it seems awesome and i think the taste would be more like the commentators replied. Amazing!! Put this in for 30 minutes into the pressure cooker and turned out perfectly! Thanks for sharing! This was fantastic! It was devoured at our dinner party and so easy to make I managed to pull it off with a newborn attached to me. Plus I love that it’s so healthy. I like your site very much. Lots of information you provided and the excellent part is people are engaging with you. This feels actually good when you comment back. Thanks for sharing and also engaging with us. The color and name of this recipe is fabulous & caught my eye! Love the use of beetroot here Angela, it can be hard to find nice recipes with it! That gold spoon too! ? Hey Nina, The cabbage gives this soup a great texture so I wouldn’t recommend swapping it out, but that’s just me! If you’d like to experiment with it, feel free, and please let us know how it goes! Absolutely delicious!! I added a bit of red vinegar while cooking and served with either cashew cheese and dill or horseradish. Making this soup for the second time tonight and I can’t wait! It was such a hit that I’m doubling the recipe. We love the Kirkland organic marinara from Costco and it worked beautifully in this soup. Thanks for including simple recipes like this that pack big flavour. 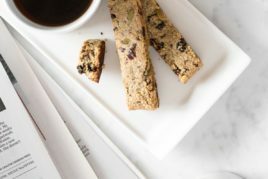 Fast and easy recipes are huge winners in our busy household these days–I’m so glad to hear this one is a winner in yours, too. :) Hope you enjoyed that second batch juts as well as the first! 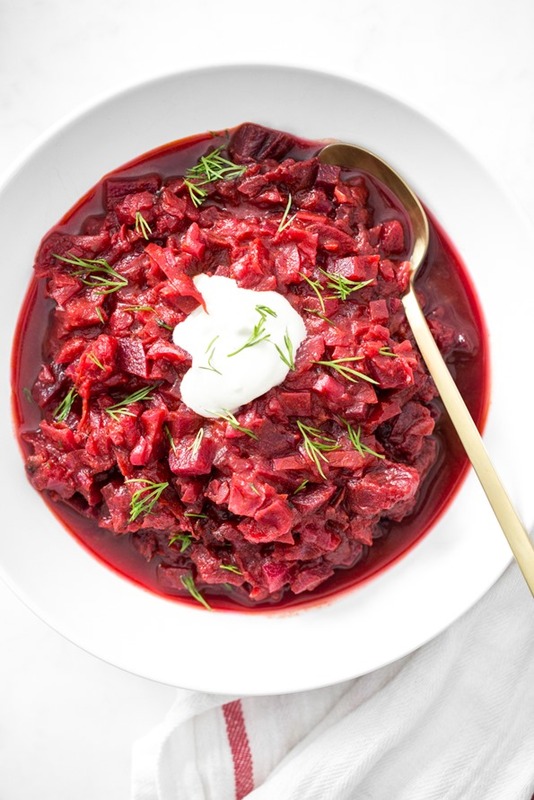 Hi, I just wanted to say I love beets and this may be my new favorite way to cook borschch! I used Gia Russa sauce and I find that it works great because it’s slightly spicy so it adds a nice depth. Love the recipe, thank you! I’m happy to hear you enjoy the recipe, Agata! And thanks for sharing your sauce rec — that slight spiciness sounds like it would be great in this dish. You should post a recipe for one! 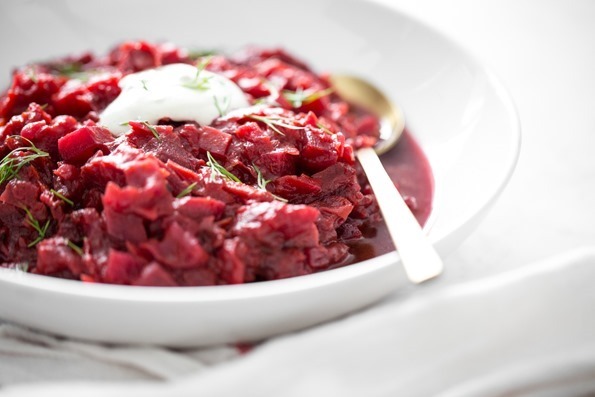 This is a great twist on Borscht. One of the tricks to add lots of flavor, is brine your beets and use the juices. Packs a punch. I ADORE this soup. I thought that the use of marinara sauce was suspect, but the soup is genius, has so few ingredients, and elevates them all. I can’t wait to make it again! I have not tried this recipe yet, but soon i am going to. Hope it will go as pretty a it looking here. This was fantastic, thank you so much! It looks SO gorgeous when served, such an amazing colour. I didn’t have marinara sauce so I just used plain tomato sauce instead and seasoned appropriately, and I also added celery for a bit more chunk. This made for VERY large, satisfying portions for very low calories and it was delicious. Glad you liked the recipe, Nikki! And I totally agree–I love how the colour just pops! Just starting vegan lifestyle, this sounds amazing! Made this soup today and I LOVE it! 10/10 Never would’ve thought of combining beets w marinara. Every recipe I’ve ever cooked from this website always tasted spot on. Thank you, Angela, for sharing! This looks great, and I love the shortcut of using marinara sauce. But I usually add in the beet greens into my borscht. What do you think about cutting back on some of the cabbage and adding in the beet greens and stalks? 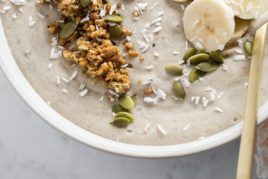 I am not vegan, but this recipe looks soooo good ! I may have to try it out. Hey there, Thanks for your great feedback! I’m so happy to hear it was a hit. I need to make this soup as soon as our fall weather starts up again! I have always avoided cabbage but just looking at your photos. I don’t know what it is but this meal looks really appetizing. I’m going to have to make this for me and my wife. I hope you enjoy it…it’s so tasty! It’s my fave way to have cabbage for sure. Hey, I totally loved your recipe. It must taste great! I will cook it once. Hi, this looks lovely and I have cabbage and bet ready for the taking in my garden right now! Thanks for the recipe! Do you ever post nutritional information for your recipes? If not I will plug the ingredients into Sparkrecipes. Just made this tonight….soooo goood!!! I used Paul Newman’s marinara sauce as I had no time to hit Costco. I have also bought the white linen brand sauce and it is great. It makes a big batch for just two of us. But I took it to work for lunch every day and did NOT get tired of it – in fact, I came to CRAVE it every day and was sorry by Friday when it was all gone! Unique flavor. Didn’t do the sour cream option. Just a good bread to go with it. Thank you! Hey Denise, Oh I’m so happy you love it as much as we do! Made it, loved it, used the leftovers smothered over noodles with feta cheese and it was just as good! And incase you were thinking you could shave cooking time by brunoise-ing the beets, they’ll still take over an hour. Worth it! Hey Brenna, I’m so happy you enjoyed it so much. Thanks for your review! Made this for dinner tonight – it was great!! I didn’t want to attempt to peel and chop rock hard raw beets so I roasted them in the oven before making the soup so the skins would slide off easily (since I discovered this method, I don’t want to deal with beets any other way). Then I followed the soup recipe and added the roasted, chopped beets at the very end. It was delicious! Thank you for the recipe. So glad you enjoyed it Tara. And yes, sometimes roasting and peeling beets is the way to go! 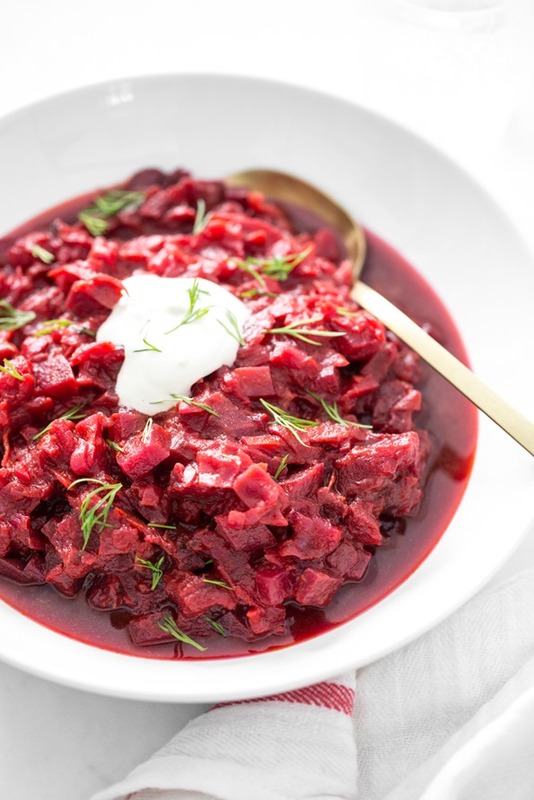 I love borscht and really enjoy the flavours of this soup. I added a couple bay leaves and some caraway seeds to give it more of the borscht flavour. Hey Amy, So happy to hear you enjoyed it. Good call on adding bay and caraway! I’ve made this soup four times in the past year and it has been my absolute favourite comfort food in the last few months! It’s also great to make in batch and eat over the course of a week and I enjoy topping it off with a little yoghurt and pumpkin seeds. I have even converted my beets hating mother into eating this! Hey Lia, Whohoo! That’s so great to hear. We adore it too…it’s one of my fave ways to enjoy beets actually! Love this soup! Made it few times last year. Just one thought- beets don’t need an hour of cooking, really may be 10-15 min because of the small pieces. I am making this soup right now once again! Thanks for the delish recipe. I just made this in under 30 minutes with my pressure cooker (Instant Pot)….about 30 minutes in total!! Fabulous with dill! That’s so wonderful to hear that it worked in the instapot!! Thanks for your review Shelagh! I made this with a 28 oz can of pureed tomatoes in place of the marinara sauce, added in a bit of basil and oregano as part of the onions base to make up for it, and it turned out delicious. Thanks!! This is delicious! I seriously did not expect it to be this good. 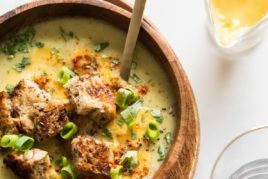 Super hearty and satisfying, and the cashew sour cream on top of a bowl adds perfect richness to the soup. I had always wanted to try borscht but thought it looks intimidating. Your take on it is so easy and low maintenance! Will be making this again. Thank you! Delicious. Made this soup last night and only used fresh tomatoes as no marinara sauce on hand. It turned out so good and will certainly make it again. Hi Joanne, I’m so glad fresh tomatoes worked too. It’s the perfect time of year for throwing them in soup! I’ll have to try it soon. I just pulled the beets from my garden and was looking for something to make. I cooked the beets in my instapot to make the peeling easy, and added the beet greens to not waste them- really good. Fingers crossed that my 3 1/2 year old daughter will like this as well! I love that you cooked the beets in the IP…great idea! I can’t wait to try that. This was so good! 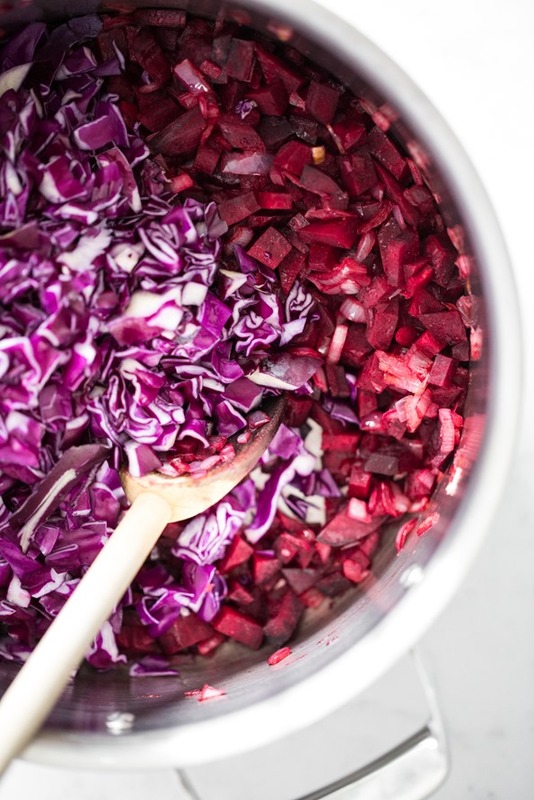 I had a couple of GIANT beets from a friend’s garden and some red cabbage to get rid of… so this soup came to mind! I added a couple of tablespoons of apple cider vinegar towards the end of cooking– beet soup (borscht) always was vinegary when my grandma made it so I wanted to have that flavour! The marinara hack is such genius! I will make this again and again, thanks Angela, you never disappoint! This was yummy but I added in soy sauce and vinegar to add a little bit more depth. And that just hit the spot. I love how this recipe is so easy, superhealthy and so cheap to make! Only set back, you really need to find quality beetroot else the flavour won’t be there. I love your tweaks Monique :) I’ll definitely have to try that! LOVED IT!! But holy cow did it take a long time to cook. Instant pot version PULEASE! Is it possible to use canned beets with this and just cook it for less time? Hey Amy, That’s a great question and I’m sorry I haven’t tried it out before so I’m not sure! I’m not sure how it would impact the texture and flavour…would take some experimentation probably! If you try anything I would love to hear how it goes.